Template by Medviation, livery and seatmap © POTKC 2019, reproduction or use not permitted without written and explicit consent. 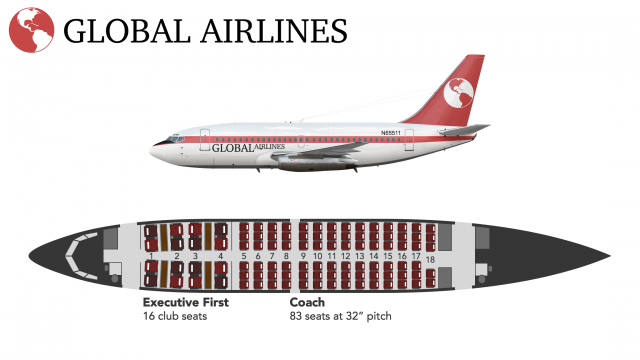 Global Airlines started life in 1980 as a minor airline, operating flights between LaGuardia Airport in New York and Washington National and Boston Logan. Its fleet at the very beginning consisted of three Boeing 737-200s and two Douglas DC-6Bs. The 737s were configured with an innovative 'Executive First' product, arranged in four sets of club seating, catering to business travellers between the three main Northeastern cities. Note: Image reuploaded due to problems with original export. See the previous version here. The seat map is really good. The livery needs some work. The livery needs some work. not a fan of the text. apart from that, good job. hmm. There are just some peices like the tail that are a little blurred. Either way very nice! is it a PNG or a JPG?